How much should a young worker save for retirement? I'm a 22-year-old college grad who has recently started his first full-time job. How much should I be thinking about retirement and what is the appropriate amount to save? -- Henry, Charlotte, N.C.
Clearly, retirement isn't going be the biggest issue on your radar screen. As a recent college grad, I'm sure you've got a lot of other things on your mind: getting your career off to a good start, impressing your boss and, if you're anything like the person I was in my 20s, maybe having some fun with friends. So I think it's impressive that you're giving retirement planning any attention at all. But I'm glad you are because to the extent you can get a leg up on it now, you'll find yourself in a much better position later in your career, whether that means being able to retire early, take a few years off without falling behind on your savings regimen or just not feeling the pressure of having to save every cent you can get your hands on in order to have a prayer of retiring at all. So let's start with the biggie: How much of your income should you be saving for retirement? It's impossible to know the precise amount. There are too many unknowns, including how much you'll earn during your career, the age at which you'll retire and how long and how well you'll live in retirement. But I'd say 15% is a reasonable target, assuming you want to have a decent shot at maintaining your pre-retirement lifestyle after you call it a career. In fact, the Boston College Center for Retirement Research recommends a 15% savings rate for the typical household. If you can't manage 15%, fine. Start with a lower percentage -- say, 10% -- but try to increase your savings rate by at least one percentage point each year until you get to 15%. If your company offers a 401(k) or similar plan, you'll want to jump all over that. For one thing, the amount you contribute annually to a 401(k) -- $17,500 is the maximum this year, $18,000 in 2015 -- is deducted from your income. So you don't pay tax on your contribution and any investment gains until you withdraw the money, ideally in retirement. In the meantime, your dough is sheltered from income taxes, which results in a larger retirement nest egg. 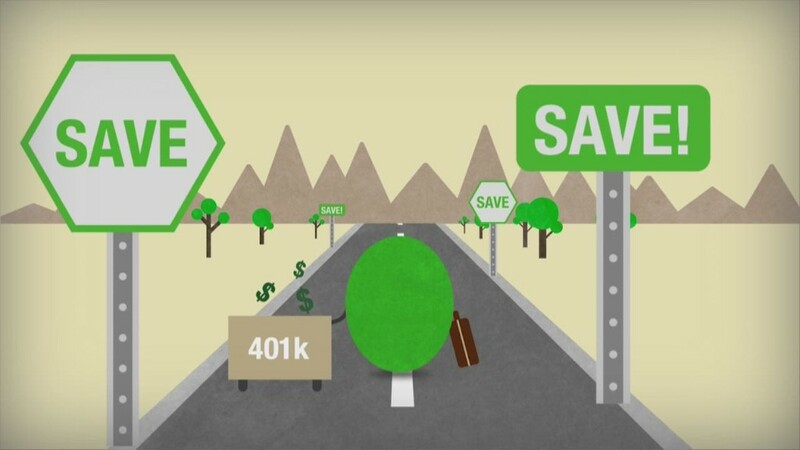 The other big advantage of saving in a 401(k) is that most employers match a portion of what you contribute, which makes it easier for you to hit that 15% savings target. Some employers also offer what's known as a Roth 401(k). With the Roth version, you invest after-tax dollars, which means you don't get a tax deduction. But you get to withdraw your money tax-free in retirement. So if you think you'll be in a lower tax bracket in retirement than you are today, a traditional, or regular, 401(k) is the better choice. If you think you'll be in a higher tax bracket after retiring, you'll do better with the Roth. If you end up facing the same tax rate, it's a wash. It's tough to predict what tax rate you'll face when you retire decades from now, so here's my quick take on choosing between the two types of 401(k)s.
If you expect your earnings to rise substantially during your career -- which I think is likely for most college grads with good career prospects -- then you're probably now in the lowest tax bracket you'll ever be in. That suggests you should go with the Roth. If you do that and your employer offers a match, you'll still end up with money in a traditional 401(k) anyway, as all employer matching funds must go into a traditional 401(k). If your employer doesn't have a 401(k) plan, do as much of your retirement savings as possible through an IRA. The maximum contribution you can make is $5,500 both this year and next. IRAs also come in two types -- a traditional IRA, which gives you a tax deduction, and a Roth IRA, in which you invest after-tax dollars. The same principle I described above applies to deciding between the two. Don't get too hung up on the traditional vs. Roth question, though. The most important thing is to find ways to save, and get as close to that 15% as you can get to it, whether it's a traditional 401(k) or IRA or the Roth version -- or even a taxable account. Whatever amount you end up putting away, be sure to invest it sensibly, which is to say put it in a broadly diversified blend of stock and bond funds, preferably ones with low annual costs. And don't let any stock market ups and downs spook you. You've got many years to recover from any setbacks. So keep saving and stick to the diversified blend of stocks and bonds regardless of what the financial markets are doing. As you're putting away money for retirement, try also to gradually build an emergency fund in a savings account or money-market fund equal to three months' living expenses. Doing that will require you to restrict your spending a bit more initially. But having such a fund will allow you to meet unexpected expenses or weather a layoff without having to dip into your retirement investments. Once you've got your savings regimen going and have some retirement savings tucked away, you can periodically go to a tool like the Retirement Income Calculator in Real Deal Retirement's Retirement Toolbox to see whether you're on track or need to save more. For now though, focus on trying to hit that 15%-a-year savings target -- and, of course on working hard at your job and having fun with friends.